Roll-up steel and aluminum coiling doors are the perfect solution when the overhead and side room space is not available for a sectional door, and applications where full windows are not needed. Our coiling service doors are able to fit openings up to 1,500 square feet (139,355 mm). 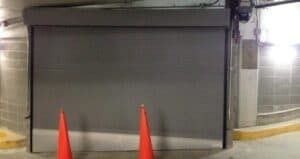 Overhead Door carries an extensive line-up of commercial rolling doors with a wide array of slat profiles, curtain materials, and colors making it easy to find a door that satisfies both environmental and aesthetic requirements. Selecting the right door style, not to mention choosing from the wide selection of colors, and profiles can be exhausting. Save time, and let us do the work for you by giving us a call at (651) 683-0307. With a few simple questions, one of our experienced Sales specialists will be able to pick the rolling door that best fits your environment. 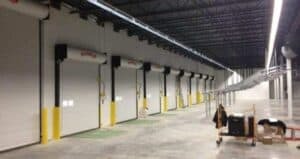 On the other hand, if you know exactly what you are looking for in a rolling or coiling door, you can review specific door specifications at Overhead Door Company’s website. Custom sloped bottom bar rolling steel door, in Saint Paul, Minnesota.